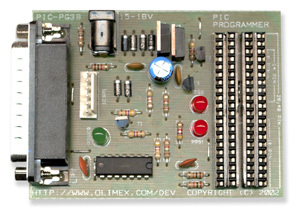 PIC-PG3B is compatible with PICALL programmer based on D.Tait's parallel port design. To operate it needs external power supply 12-15VAC or 16-18VDC. It supports all 8/18/28 and 40 pin PIC microcontrollers which allow serial programming. PIC-PG3 have connector and cable for ICSP programming and can be used to program all PIC-PxxB prototype boards. This product was added to our catalog on Thursday 06 January, 2005. There are 61 guests online. Copyright © 2019 Gtronica - All rights reserverd.